Lake Atitlán is one of Guatemala’s prime tourist destinations, along with the jungle ruins of Tikal and the volcano-ringed colonial town of Antigua. 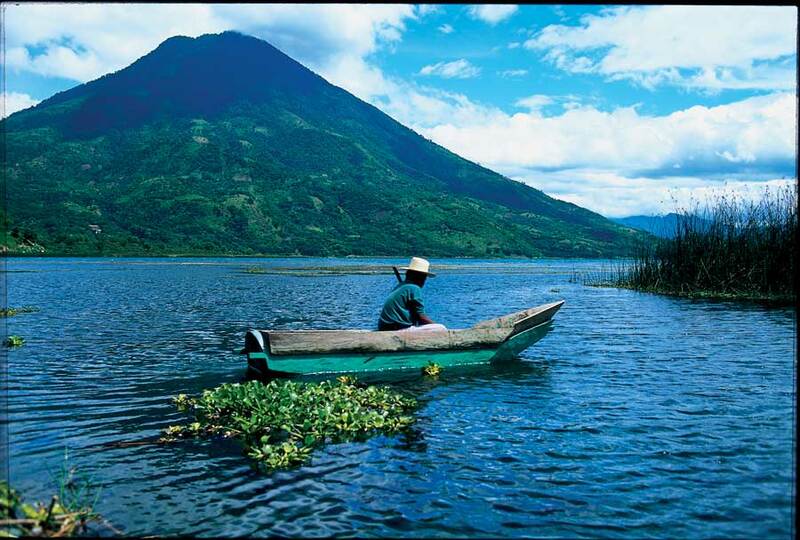 Atitlán is a large, beautiful lake, recognized as Central America’s deepest with a depth reaching 340 metres. It is surrounded by verdant hills, majestic volcanoes, and picturesque villages inhabited by largely indigenous Mayan people. While most tourists tend to stay in the largest town and transportation hub of Panajachel, one of Lake Atitlán’s quirkiest and most interesting sights lies in the smaller community of Santiago Atitlán, a long but undeniably scenic boat ride away from Panajachel on the opposite side of the lake. 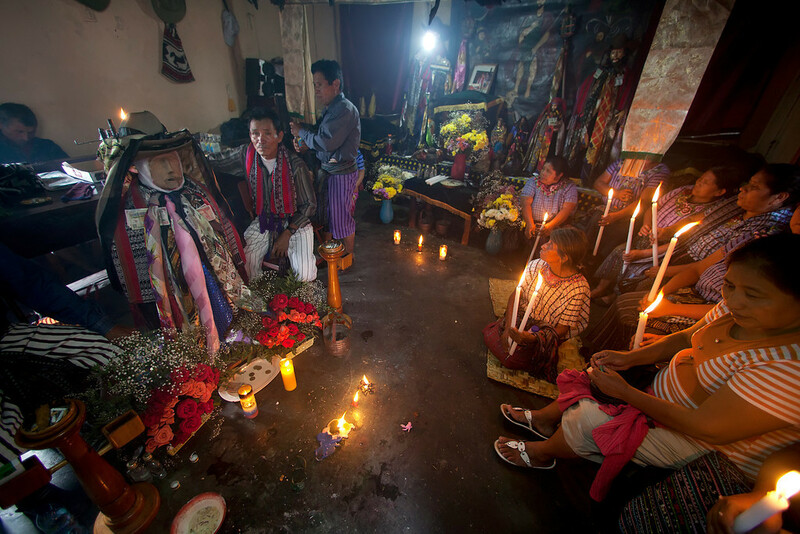 Santiago Atitlán is home to Maximón, a malicious saint worshipped in indigenous communities across Western Guatemala. His present-day form is derived from the pre-Columbian Mayan god Mam, with influences from the Spanish conquistadors and the Roman Catholic Church (although the latter does not endorse the worship of Maximón). Legend has it that Maximón was a notoriously hedonistic man, whose inability to reign in his libido resulted in his fellow villagers lopping off his arms and legs, but not before he was possessed by a god and turned into a saint. As a result, most effigies of Maximón are short, lacking their limbs. Always wearing his signature hat, he is also often seen “puffing” away at a cigar or cigarette, and worshippers often bring him spirits and cigarettes to appease his appetite for vice. Every year, Maximón is elected a new home, where he is transported during an important procession every Holy Week in April. As such, finding him can be a bit of a challenge, especially considering the winding streets and small alleys of Santiago Atitlán. Your best bet, after your boat embarks at the village dock, is to ask a local rickshaw driver to take you to him. Eventually, with a little luck, you will find Maximón hidden away behind the colourful walls of Santiago Atitlán. You may be asked to pay a small donation to visit him, and another one to take photographs. 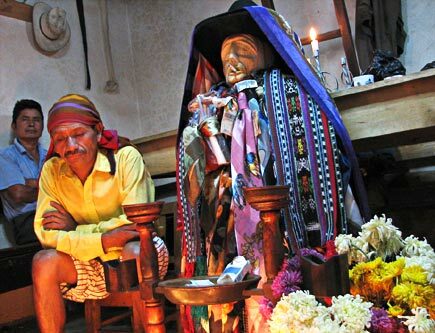 Maximón himself is a wooden idol adorned with colourful cloths and garlands, not unlike an exaggerated version of the local people. His dark “home” is lit by many coloured candles, adding an esoteric vibe to his shrine. Small offerings of coins, cigarettes, liquor, photographs, scrawled notes and the like clutter in front of Maximón, whose unfazed eerie wooden gaze pierces through the smoke of the incense and the candles around him. Not many visitors to the Lake Atitlán make the trek to see Maximón, so you may very well be the only tourist there to see him, which provides for an interesting glimpse into local Mayan spiritual traditions without being hawked plastic trinkets from China on your way out. Santiago Atitlán is a town that may need a saint more than the rest, having particularly suffered from the brutality of the Guatemalan Civil War and having one of its bordering towns devastated by a mudslide caused by Hurricane Stan in 2005. However, the denizens of Santiago Atitlán look to the future and keep their good spirits, as evidenced by their good-natured adulation of the quirky Maximón. It’s hard not to love him, flaws and all. WHERE: First you need to get to Lake Atitlán via Panajachel from Antigua or Guatemala City. Then make your way down to the docks and hire a boat to take you across the lake to the town of Santiago Atitlán. Then, you should hire a rickshaw to take you straight to the house that is currently hosting Maximón, or hire a local to guide you there on foot. WHEN: Year-round, but if you make it there during Semana Santa you may catch Maximón during the grand procession in the streets that leads him to his new home for the coming year. HOT TIP: Don’t leave Lake Atitlan without trying some fish from the lake, especially the small bags of tiny fried fish doused with salt, lime, and chile. ¡Qué rico!